Want to find out what you can do on this site? Just follow the links - click on the red words. Find Andrew - or a message - by touching pictures with you cursor. Touch Thudd! Andrew's Adventures Andrew Dubble gets into lots of weird trouble. Find out about it here!! Andrew's World Andrew's cousin Judy has been on four safaris in Africa and knows how to fly a helicopter. His Uncle Al works on top-secret projects. And Andrew's best friend isn't even human! Find out more! Read pages from Andrew Lost! Microscopic World All around you, there's a world that's stranger than anyone could imagine. You can't see it with your eyes. But you can see it here! Investigate This! 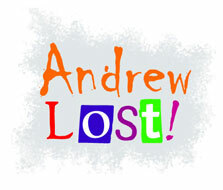 Find out more about the weird and interesting stuff in Andrew Lost! Send Inventions! Andrew's favorite thing is making inventions. Do you make inventions? Do you invent jokes or riddles or poems? Find out how to send them in. Your invention could be posted on the AndrewLost.com web site! Find the Books! Find Andrew Lost in a bookstore or a library!